For over 20 years, Southern Motion has been committed to America and making quality furniture. All Southern Motion furniture is made in the USA. At Al’s Furniture, we do our best to provide you with quality American made products. 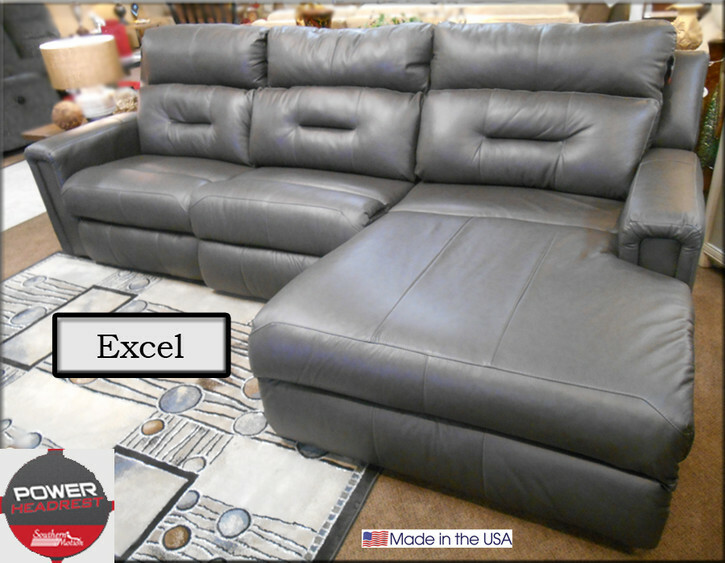 Southern Motion sofas and recliners have many different leather and fabric options to choose from. 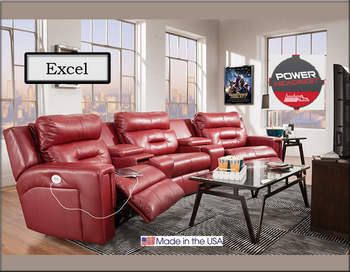 And they have great features like; power adjustable headrest, and power lumbar support. If you have any questions about what you see or want to check stock, please call us at (209) 524-7533. The Southern Motion Avatar Sofa Collection offers comfortable European style with pad-over-chaise seating, and French seams throughout. 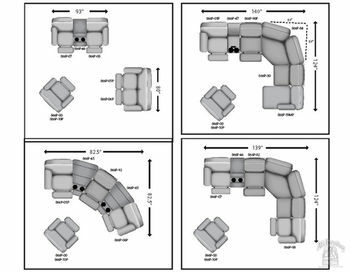 The Avatar Collection is available with sofa, sofa with console, loveseat, or a recliner so you can design custom seating the way you want. 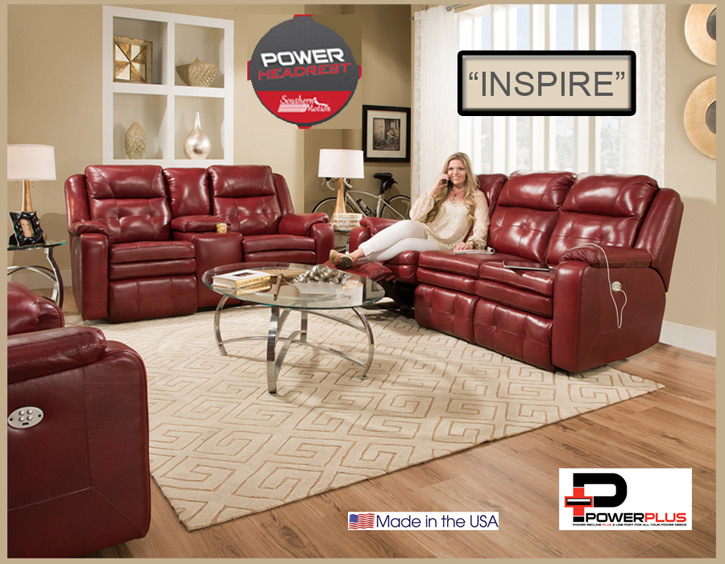 The recliner comes in non-power or power, rocker or wall hugger, and with or without power adjustable headrests. It is even available as a power, Lay-Flat Lift Chair, with or without the power adjustable headrests. 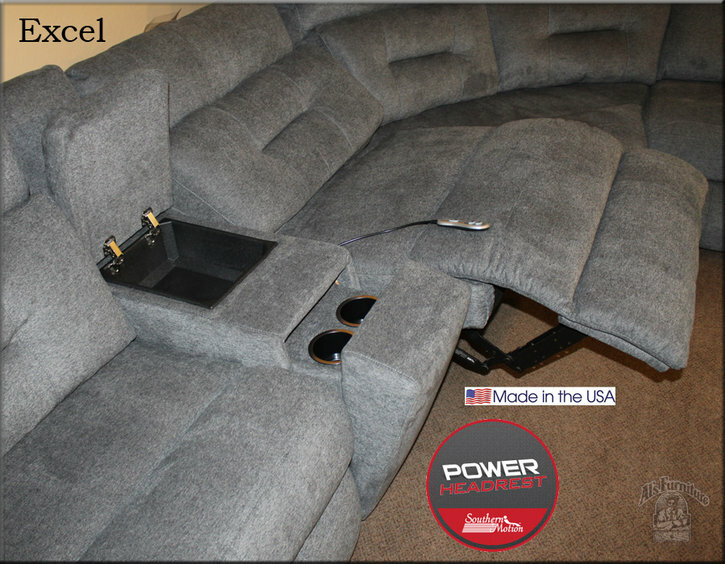 Southern Motion furniture is well known for their whisper-quiet electronic motors, and being Made In America. Choose from hundreds of fabrics or leathers to customize the look of your new sofa set. Of course, there’s a USB charging port in each 4 button control panel, for convenient charging electronic devices, while you relax. Come in and see the Southern Motion Avatar Sofa Collection, in our Modesto furniture showroom today! The Southern Motion “Knock Out” Motion Sofa Collection has impeccable styling. 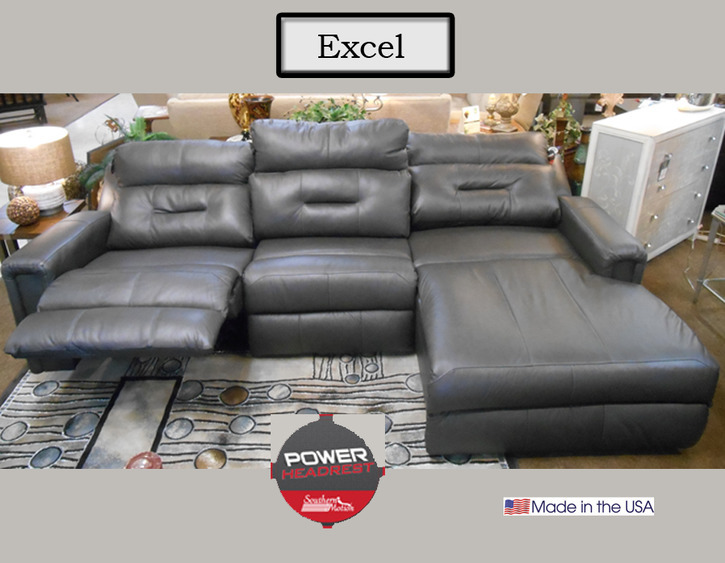 It’s flexible enough to be used in the most formal of living rooms, or even the most casual of man caves. Note the subtly curved bottom of the arms, and the fact that this shaping continues all the way down the length of the arms...this is unusual for motion furniture. In addition to the shaping, the arms of the “Knock Out” also includes vertical French seams which help to add a new level of interest. Clean bustle backs have a slight crown on the outside edges which soften their transitions, and are also mirrored in the outside edges of the pad-over-chaise seats. While all of the “Knock Out” Collection’s aesthetics are attractive, its extreme comfort is where it instantly floors its rivals! 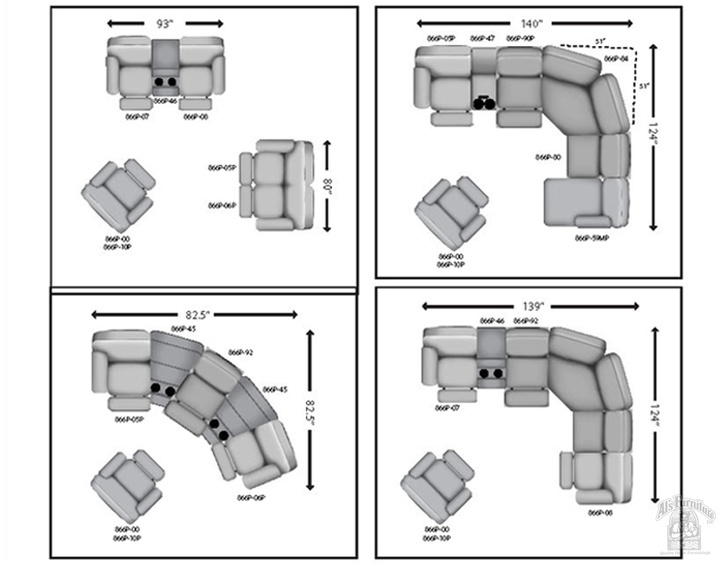 The Southern Motion Excel Sofa Collection can be configured in many different ways to fit the needs of any space. 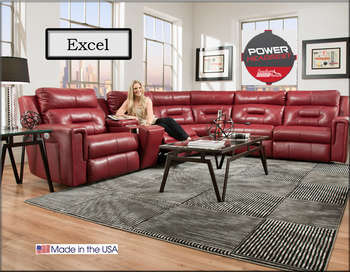 We show it on our floor in a 6 piece sectional. 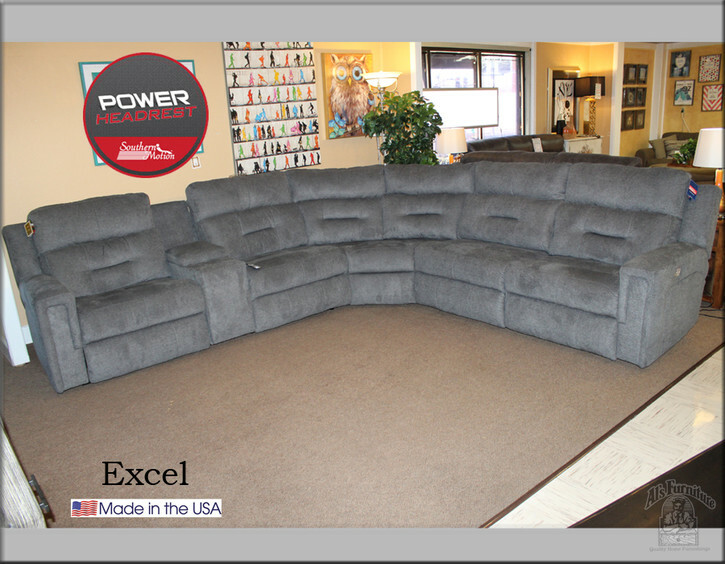 The extra-wide seat of the Excel Sofa Set provides ample room for relaxing. You can combine multiple chairs with Southern Motion’s 22 degree wedge consoles, for a unique Home Theater configuration! Also, these wedge consoles have hidden cup holders and storage. 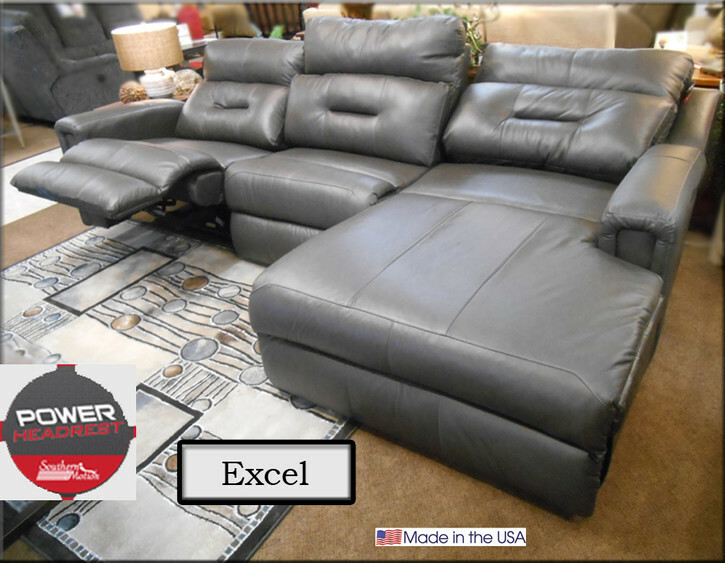 This sofa set comes in leather or fabric, along with power reclining, USB charging ports and adjustable headrest options for true comfort and relaxation. 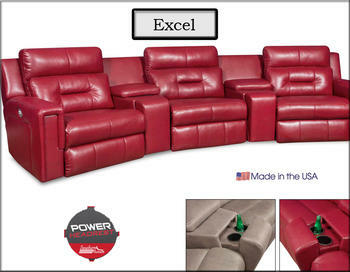 Like all Southern Motion furniture this set is made in the USA. Come out to Al’s Furniture, Modesto's best furniture store, and try out the Excel sectional. The Southern Motion Fandango Sofa Collection may be simple in design, but it is jam packed with comfort and quality. Just like all Southern Motion models, you get unbelievable comfort in their pitch perfect seat, along with incredible plush comfort and made in America. The Fandango provides great sitting comfort due to the Dacron fiber that is wrapped around the foam core in the cushions. The recline mechanism is smooth and can be upgraded to power recline if desired. 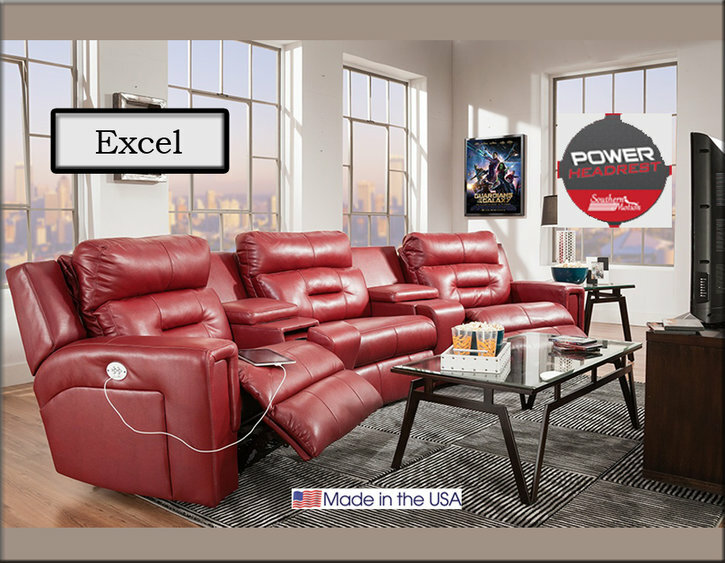 Another option is a dual USB port located with the power recline switch, enabling you to charge your electronics and use them while sitting in your favorite chair. 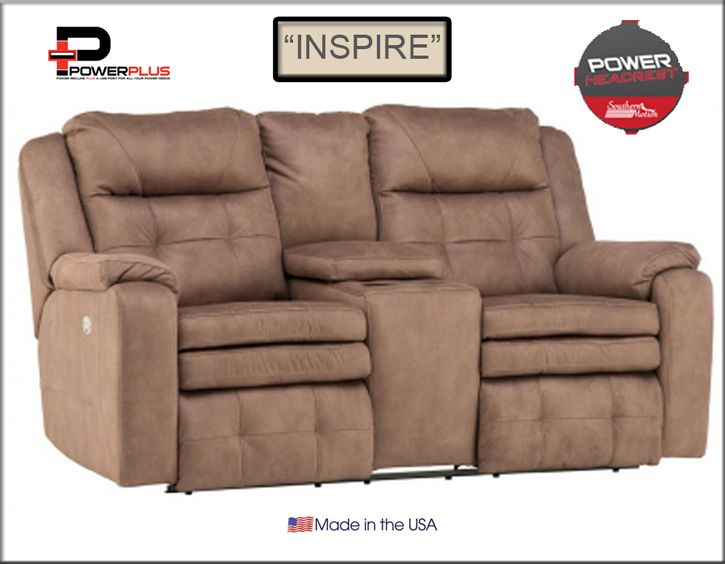 The Southern Motion Fandango Collection includes a double reclining sofa, loveseat, loveseat with console, wall hugger or rocker recliner and sectional all customizable with power and power headrest. The Fandango can be upholstered in hundreds of colors and in leathers or fabrics. This model offers the best in style and comfort that will ensure years of long lasting enjoyment. Come visit the furniture store in Modesto that offers you the best in quality and comfort, Al’s furniture. Southern Motion hit a Grand Slam with this new Power reclining sofa, loveseat, and recliner. It has power reclining options, adjustable headrest, USB ports and extraordinary comfort. This set is guaranteed to make your life easier and much more relaxing. The Grand Slam has countless fabrics and leathers to choose from and outstanding warranties. Come on in and give it a try, at Al’s Furniture! 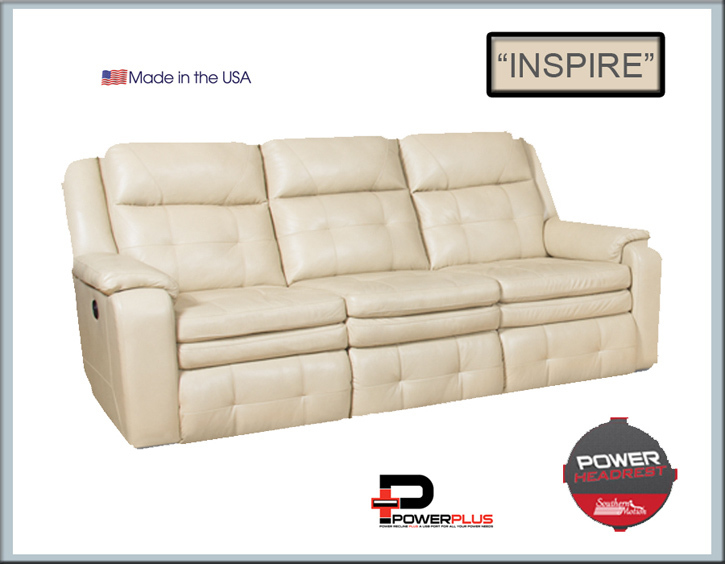 The Southern Motion “Inspire” motion collection offers the best comfort and unlimited positioning. While it may seem like a luxury, you will soon find that having power reclining furniture and its customized position capability really is a necessity for your home. Customized motion means that you can stop the recliner seat, back and headrest at whatever position best suits you. Whether you need to soothe back pain or sit up to eat a snack while you watch TV. Gentle, power motion is suitable for all levels of mobility, and is easy to use. 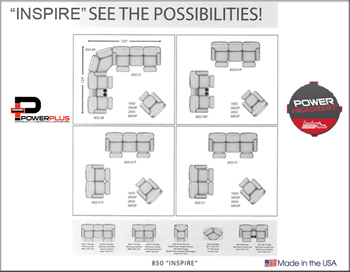 The Inspire collection comes in a sofa, loveseat, recliner, and customizable sectional options. It features power adjustable headrest that allows you to adjust the headrest to your desired position, with the push of a button. It also offers a USB port to charge your phone, laptop, or tablet from the comfort of your chair. The Inspire Collection is on display at Al’s Furniture. Make that short drive way out McHenry Avenue, and experience this comfortable collection for yourself. The Uptown Collection from Southern Motion brings the highest levels of comfort disguised in a perfectly clean and crisp style that serves as an excellent canvas for any of the over 150 leathers or fabrics/colors available to custom order. The Uptown is the most versatile collection to complete your living area and bring a whole new level of comfort into your home. 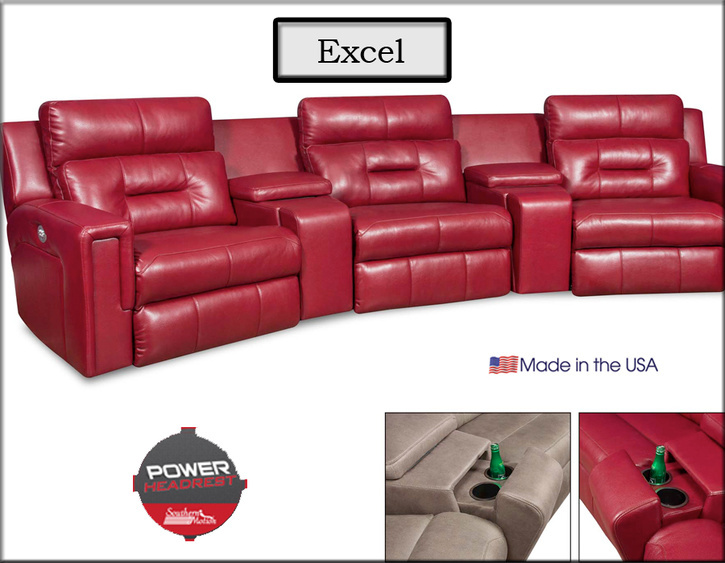 The Uptown Collection is available in double reclining sofa, loveseat, loveseat with console, wall hugger recliner, rocker recliner, and sectional. 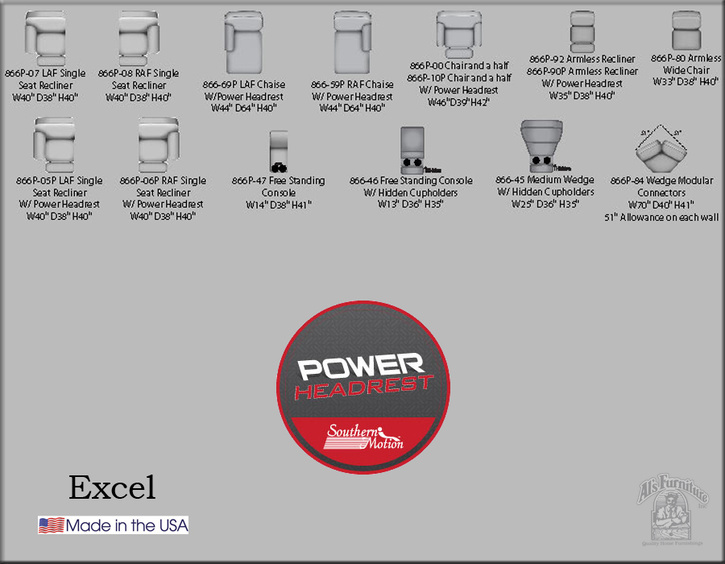 All are available in non-power or power with power headrests. 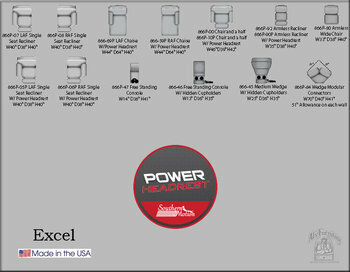 Uptown is also available in a power lift chair, with or without power headrest. All southern Motion furniture is Made in the USA. 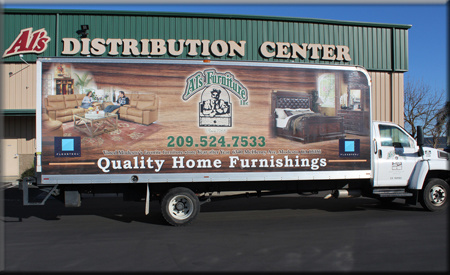 Stop by Al’s Furniture Store today and see why we are voted Modesto’s favorite furniture store, year after year! We deliver your furniture and set it up for a very reasonable fee. Our furniture delivery fee varies with how many miles we have to travel. We deliver to all the following California cities as well as areas in between; Modesto, Turlock, Oakdale, Riverbank, Ceres, Salida, Patterson, Waterford, Empire, Tracy, Ripon, Valley Home, Hughson, Hickman, Escalon, Manteca, Valley Springs, Sonora, Stockton, Lodi, Merced, and Atwater. If you don’t see your city listed just ask!